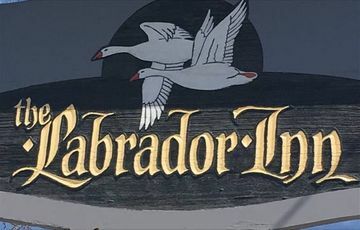 The Labrador Inn allows visitors to the Happy Valley-Goose Bay area to relax in comfort. Whether you are an adventure seeker or commercial worker, our skilled and courteous staff looks forward to making your stay with us an enjoyable experience. Nestled into the beautiful scenery surrounding Lake Melville, The Labrador Inn is centrally located outside of CFB Goose Bay, the site of NATO low-level flight training. Our inn is an area landmark that is just 5 minutes from the airport, the port of Goose Bay and the exit to the Trans-Labrador Highway. We have a restaurant on site, video lottery terminals and all the conveniences you need, including satellite TV and high speed wireless internet. Learn more about our rooms and view our photo gallery. Air Canada, Air Labrador, Provincial Airlines (PAL) and partner Innu Mikun operate regular and frequent services to Happy Valley-Goose Bay from St. John’s, Gander, Deer Lake, St. Anthony, Halifax, Montreal and Labrador coastal communities. Woodward Marine operates “The Apollo” ferry between St. Barbe, on the grandly scenic Great Northern Peninsula of the island portion of Newfoundland, and Blanc Sablon on the eastern edge of Quebec. Blanc Sablon is just minutes from southeastern Labrador and the start of your adventuresome and gorgeous drive north through Labrador, passing historic world heritage sites such as Red Bay, Battle Harbour and Lance au Clair. Make your stay in central Labrador a pleasant one with the affordability and comfort of The Labrador Inn. Book your reservation today. Our daily buffet is a hit with guests! Visit our Restaurant & Lounge page to learn more about Larry's Pizza & Waffle House. Discounts available on longer stays. To learn more about longer stay discounts, please call for details.